As a follow up to her two bestselling books, Bittersweet and Cold Tangerines, author and blogger Shauna Niequist returns with the perfect read for those who love food and value the community and connection of family and friends around the table. Bread & Wine is a collection of essays about family relationships, friendships, and the meals that bring us together. This mix of Anne Lamott and Barefoot Contessa is a funny, honest, and vulnerable spiritual memoir. 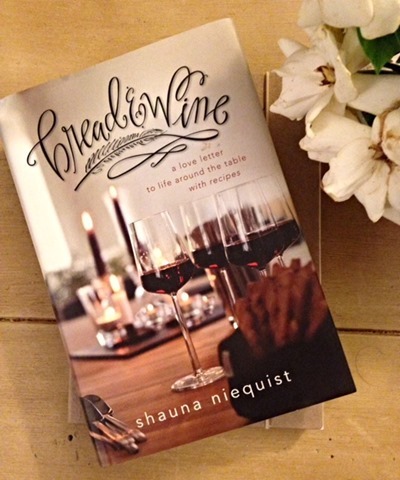 Bread & Wine is a celebration of food shared, reminding readers of the joy found in a life around the table. It’s about the ways God teaches and nourishes people as they nourish the people around them. It’s about hunger, both physical and otherwise, and the connections between the two. I had actually heard about this book from a woman in MOPS. She raved about it and gave a copy away as a prize. I actually enjoyed the book. I thought I might not like it because I feel like I’ve been reading choppy books lately…books with a bunch of random information thrown into a book, not always with any sort of point, order, etc. I think part of what I liked is that she made it important to eat with friends and family. It’s something we do with the girls, all sit and have dinner together. It was important in my family growing up, too. And I liked that most chapters ended with a yummy recipe. She’s not a fancy chef, but learned some new meals and techniques and likes to play and experiment with food. I wasn’t sure what to expect since I knew there were some religious references, especially at the beginning, but that didn’t end up being a major trend in the book. Some of the revelations she had from meals or events really struck a chord with me. I recall thinking a couple times “I really needed to read that right now.” So although I couldn’t relate to all of the content, I came away really liking the book and enjoyed it a lot. If you are looking for a good book with a wide variety of topics with a focus on family, food, entertaining and gatherings, give this book a try. I think this is a book I would like to reread one day because I feel like I could get even more out of it.